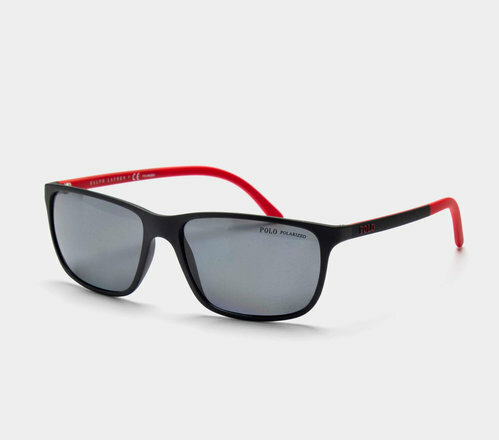 Squaring off a stylish look, pull on these Ralph Lauren Polo 4092 Sunglasses in Matte Black and Red. These Ralph Lauren sunglasses are a fusion of two iconic styles creating one distinctive design. Combining the square and wrap styles, the matte black frame creates a greater contrast with the red of the ear stems. With the famous Polo name the only addition, polarized dark lenses, provide 100% UV protection giving ultra clear vision. Smartly presented with a durable frame with a perfect finish, these Ralph Lauren sunglasses come complete with their own stylish carrying case so you can be prepared for any occasion, indoors or outdoors. As timeless as their clothing range, pull on these Ralph Lauren Polo 4092 Sunglasses.